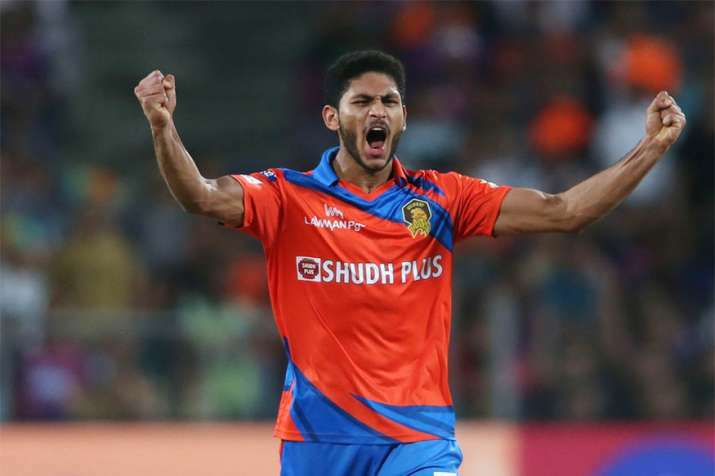 Chennai, Dec 6: From a promising bowler in Kerala to the 'Emerging Player' award in this year's IPL, to a spot in the India T20 team, Basil Thampi's rise has been rather quick. The 24-year old paceman, who has been in the selectors' radar for a while, said he was surprised to learn from the KCA secretary Jayesh George about him being picked for the national side. "I am feeling very proud and happy. But, I was surprised to learn from KCA secretary Jayesh George that I had been selected for the Indian team. It is a great moment as it has always been my dream to don the national colours," Thampi told PTI from Surat. The lanky paceman is currently with the Kerala team, which will face Vidarbha in the Ranji Trophy quarterfinals beginning on December 7. He is keen to help his state team reach the Ranji Trophy semifinals for the first time ever by putting it across Vidarbha. "In the past one year, I have become a more confident bowler and I'm hopeful of doing well for India against Sri Lanka," said Thampi, who trains at the MRF Pace Foundation in Chennai under the watchful eyes of Australian legend Glenn McGrath. The Kerala bowler said he had learnt a lot from McGrath at the Pace Foundation, especially on the need to keep bowling with pace. "He (McGrath) advised me not to lose pace while bowling and I have kept that in mind. I have also gained a lot by interacting with him and Senthil Sir (M Senthilnathan, head coach the Pace Foundation). They have motivated me a lot and given me a lot of confidence," Thampi said. Having turned out for Gujarat Lions in this year's IPL and announcing himself as a man to watch for the future by unleashing yorkers at will, Thampi is now keen to do well at the international level. "The IPL this year was a turning point in my career, especially the match against Mumbai Indians. In my last two overs I bowled something like 10 yorkers to batsmen like Rohit Sharma and Kieron Pollard. This got me noticed," he said. He is looking forward to bowling with M S Dhoni donning the big gloves. "It want to bowl and M S Dhoni to keep. It has been a long-time dream of mine," he added. The performance in the IPL gave him the confidence to bowl well against different opposition, he said and added that he carried it forward into the "A" team matches and the Duleep Trophy. Thampi, while playing for India "A" against New Zealand "A" in a one-dayer in Visakhapatnam in October, removed three rival batsmen in four balls to trigger a collapse. He has been in good form in the ongoing Ranji Trophy tournament too and has picked up wickets with telling yorkers. Thampi attributed the skill to come up with yorkers, almost at will, to playing tennis ball cricket when he picked up the game. Former India pacer Tinu Yohannan, who is bowling coach for Kerala currently, said it is "a well-deserved break for Basil." Also, he said his consistent performances in various tournaments had earned him a spot in the national squad. "Really proud moment for us in the Kerala team and Kerala cricket. His consistent performances from last year's Syed Musthaq Ali Trophy has earned him a call now," Yohannan said. "He is in really good shape and perfectly ready for the opportunity," the player-turned-coach, who featured in three Tests and three ODIs for India, said. Moreover, Yohannan said, "Thampi has been consistent in all the opportunities he has got after being the 'Emerging Player' in the IPL." Former Australia cricketer and well-known coach Dav Whatmore, who is coaching the Kerala team this year, also heaped praise on Thampi and said he had great potential. "Very happy for Basil. He's got great potential and in time I feel will play in other formats," he said. MRF Pace Foundation head coach Senthilnathan said it was a great moment for the academy as Thampi got a national call- up. "It is a great moment for us (at MRF Pace Foundation). Thampi has put in a lot of hard work and learnt from McGrath. He has to continue the good work and make it in the other formats too," he added. "He has a very good yorker and it can be useful at the highest level. Hope he can do well," Senthilnathan said.